The Eight of Pentacles tarot card represents a form of self-enforced isolation. This can be during a time of apprenticeship or education, or the deep investment in the quality of a project. This can also indicate a new beginning in your work situation, leading to such things as a promotion, or a new training period. There is a decided dedication at this point of the Minor Arcana. 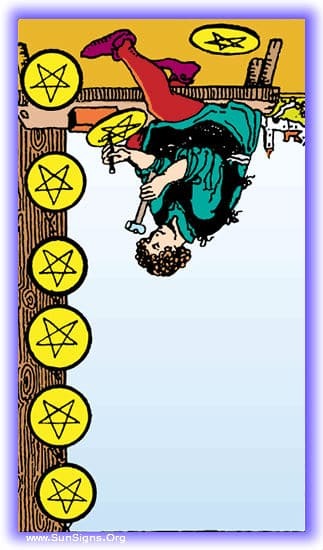 The Eight of Pentacles indicates that there are some positive changes coming. There will be time spent in education, a promotion in your work, or a time of unprecedented focus on your education or vocation. It can also indicate that you are steadily dedicated to improving your current situation, unhappy with the state of things as they are. The Eight of Pentacles is a signal that now is a good time for all these things. The past few months have been very fulfilling, with your mind focused closely on your project. The progress you’ve made is significant, and is developing an excellent foundation for the things to come. This tarot card coming up in its current position indicates a need for you to focus your attention on the projects at hand. If there are opportunities at hand regarding education or advancement in your employment, now is the time to take advantage of them. The future will be bringing new opportunities in your employment or education, it will require a focused dedication to take full advantage of it, but will also result in laying a solid foundation for future progress. There is a saying, “Can’t see the forest for the trees”, when the Eight of Pentacles comes up reverse, you are in danger of being described by this old adage. The Eight of Pentacles can be perfect in a world where nothing changes, but in the real world nothing is static. At some point the old ways will no longer be the best way. 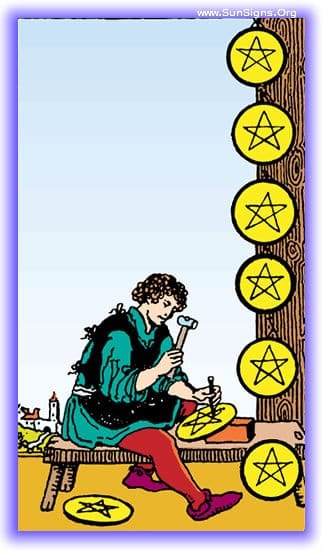 Much like the Seven of Pentacles this indicates that it’s time to stop investing energy into your current project. Alternately it may mean that you simply don’t have enough energy or ambition to give to this project, it’s just not speaking to you. You’ve been buried, focused too closely on the details of your situation in this past period. Things have been changing around you and you have found yourself utterly unaware of this fact. This is a warning to refocus. This is an indication that your current project is taking far too much of your time and energy, and you need to step away from it before it’s sucked you in too far. While you proceed, remember to keep your view on the world at large, ready to account for any changes that are coming. You’re going to reach a point in your current path where you lose the energy and ambition to keep going on the project. This is a call for you to pace yourself. Focus on finding your ambition and passion for the project so you can continue. It may require you to change projects entirely, but be aware the period of burnout is coming. Previous What Is The Difference Between Black Magic & White Magic?